A strong strain of pop classicism and a certain quantity of melancholy runs through this record. 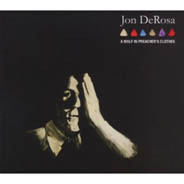 DeRosa’s deep, resonant voice reminds you first of Scott Walker and Richard Hawley but it’s not fanciful to go further back, to singers like Sinatra and Tony Bennett, especially when you hear DeRosa on his versions of the Blue Nile’s ‘Easter Parade’ or the LD Beghtol song ‘Who Decides?’ The literate chamber pop – ‘True Men’ references Robert Mitchum and William Holden and is the source of the album’s title – puts you in mind of Stephin Merritt’s work while the orchestration is well-sourced, featuring a host of players including cellist Julia Kent from Antony & the Johnsons and Jon Natchez on trumpet. It’s a far cry from DeRosa’s ambient-pop project Aarktica. Wolf… resurrects classic pop tropes, avoiding cliché or parody; ‘Say Goodnight’ is a lovesong with an unsalacious twist while ‘Teenage Goths’ is an insistent showtune despite the quirky title. But the standout song is the opening track; ‘Birds of Brooklyn’ is like the 60s as interpreted by Echo and the Bunnymen, accompanied by strings and brass, comfortably straddling the decades so that it sounds both classically old and glisteningly new. As a taster for the record, fans of the Magnetic Fields, Richard Hawley and late 60s Scott Walker (Scotts 3 and 4) should make a date to hear it.